Presented in partnership with the New Orleans Public Library, P.3Reads invites participating artists to share the books that have been important to them–either in their personal lives or their work–and to discuss them monthly in a conversation with members of the New Orleans community. The origin of this program came about because Artistic Director Franklin Sirmans has been deeply influenced by several books in his selection for Prospect.3, in his articulation of the concepts for the exhibition. As a writer and long time critic, literature and art have always gone hand-in-hand for Franklin. For Franklin, a key novel is The Moviegoer by Walker Percy, which was the subject of the first P.3Reads discussion at the Main Library in January, 2014. Other books important to him are Invisible Cities by Italo Calvino, Things Fall Apart by Chinua Achebe, Another Country by James Baldwin, The Book of Laughter and Forgetting by Milan Kundera and Blindness by José Saramago. Special thanks to Henry Lambert and R. Carey Bond for their generous support of this program, as well as the Joan Mitchell Foundation, the Edward Wisner Donation Fund of the City of New Orleans, the Ruth U. Fertel Foundation and the National Council of Jewish Women/ Greater New Orleans Section. Norman Mayer Library, 3001 Gentilly Blvd. Refreshments offered courtesy of Whole Foods Market. P.3READS, a Prospect New Orleans Public Program, is inspired by Artistic Director Franklin Sirmans’ vision for Prospect.3 (P.3), in which the novel The Moviegoer by Walker Percy, among other books, has played a central role. 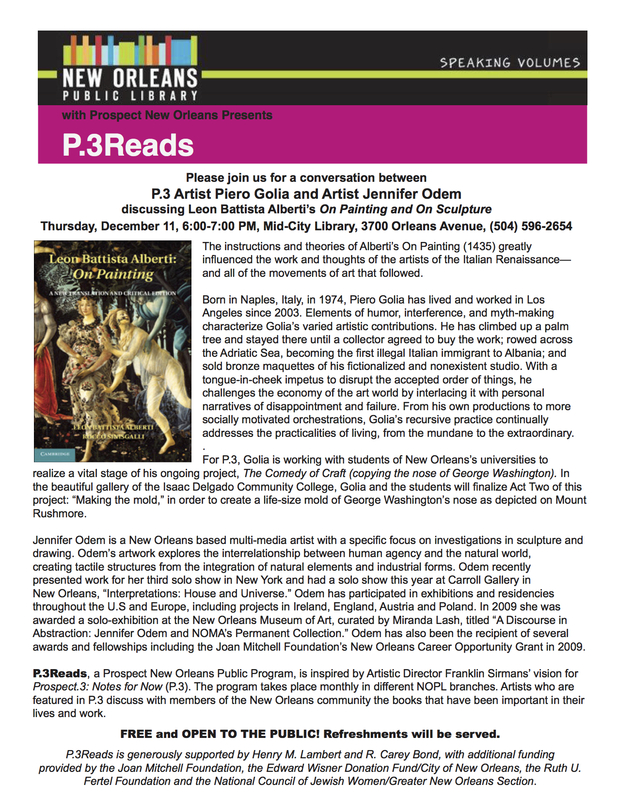 P.3READS will take place in different Public Library branches each month throughout 2014, featuring artists who will participate in the upcoming biennial. Speakers will explore and discuss the books that have been important in their lives and work, in conversation with New Orleans community members. James B. Borders IV, consultant and writer, will engage Lisa Sigal, an artist from Brooklyn, New York, in an open and participatory discussion about the acclaimed book “Open City” by Nigerian-American author Teju Cole. Art, urban space, identity and many other issues converge in this exciting novel. Cole was most recently included on The Verge 50 list of people “who changed our lives” in 2013. In anticipation of this event, Susan Larson will interview Lisa Sigal on NPR in her regular program “The Reading Life” on February 18 at 1:30 pm. P.3READS is generously supported by Henry M. Lambert and R. Carey Bond, with additional funding provided by the Joan Mitchell Foundation and the Edward Wisner Donation Fund/City of New Orleans.